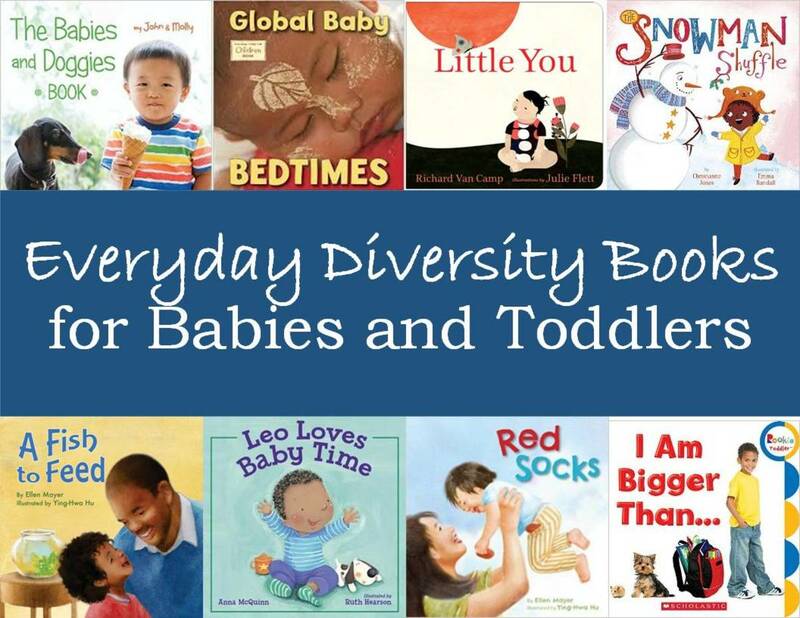 If you’ve decided to give your children or grandchildren a book for the holidays, congratulations! Books make great keepsakes, but more importantly, they give you an experience to share with children as you read the story and talk about the pictures. For a child, there is nothing cozier than cuddling up with a loved one to hear a story. And that closeness is one of the main reasons that we read to our little ones. But tucked into the fun, children are also learning lots of things that will help them in school. They are learning vocabulary (books generally have a wider range of words than we use in everyday conversation) and how letters make words. They are learning about the world around them (that’s early science), how to describe feelings, how cause and effect work—a whole host of things. 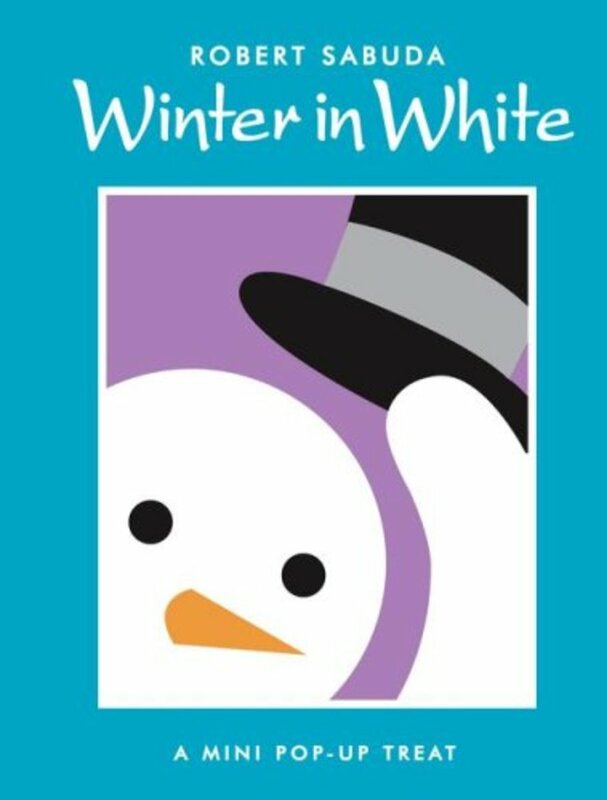 After 25 years as a children’s librarian, I’ve chosen here a dozen wintertime book that I think are the best for sharing. I’ve included some tips about how to talk about the book and some ideas for activities you can do with the children that build on ideas in the book. I hope you and the children in your life enjoy them as much as I do. Here's an idea for the youngest children. 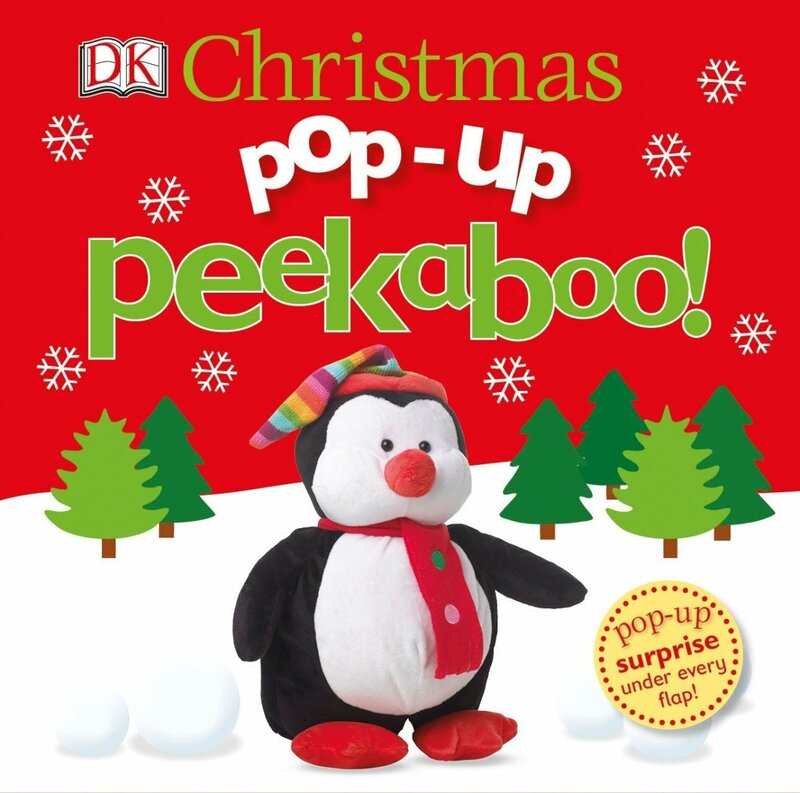 They love a game of peek-a-boo, and this little lift-the-flap book, Pop-up Peekaboo Christmas fills the ticket. It's made of sturdy, somewhat washable board book material, so little hands should be able to handle it a bit without it falling apart. 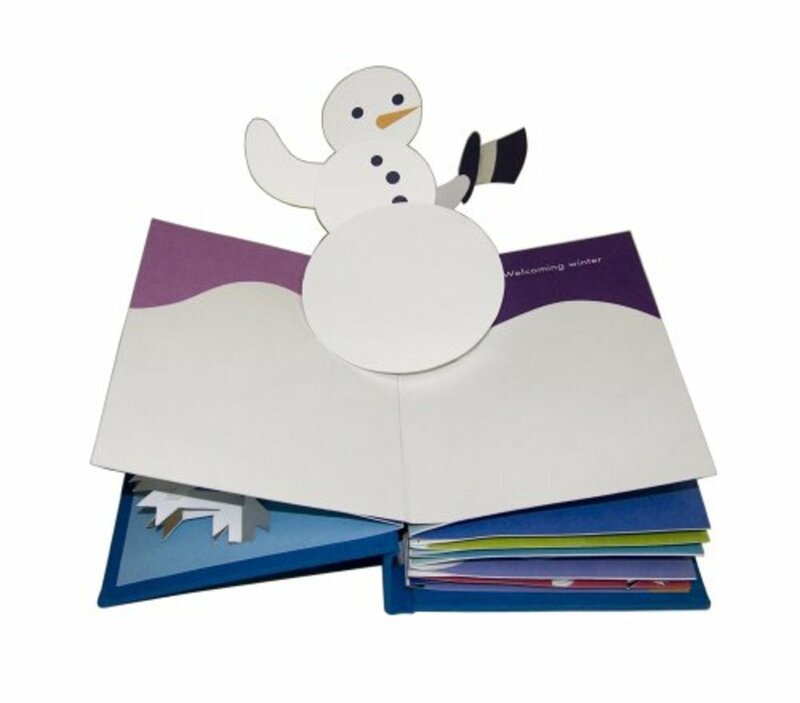 Each page contains a little rhyme with clues to the object, and you can lift the flap and see what is hiding behind the snowball, or in the stocking, or the chimney, or the Christmas tree. And, even though a book like this seems simply like pure fun, there is a lot of learning going on. First, the child is learning that we read books left to right because the flap is always on the right. If you point to the words on the left as you read them, you will reinforce this idea. Now, I know that you're not expecting that baby or toddler on your lap to be able to understand a concept like "words" or "right-to-left" right away, but the more you read to them through the years and point out the words, the more they will understand that you are reading the words and not the pictures and that there is certain order in which people read a book. Also, a book like this helps to build the child's vocabulary. They will see pictures of common things around the house at Christmas, and they will hear you say the word. After a few readings (because we always end up reading their favorite books several times), they will put the two together. Here's a way to extend the learning from this book while playing another game with your grandchild: find a 3D object that is like the things in the book. For instance, I have a little plush snowman that I can use. I put a scarf over it and say "Where's the snowman?" then pull it off and say "peekaboo." If I hadn't read Jingle Jingle out loud to a group of kids, I'm not sure I would have appreciated what a brilliant book it is. It's a simple story, really. When I read it to a group, I like to give each person some jingle bells so they can make the sound effects in the story. If you have just one or two kiddos, this idea works just as well. You can even buy special jingle bell musical instruments that children can use. 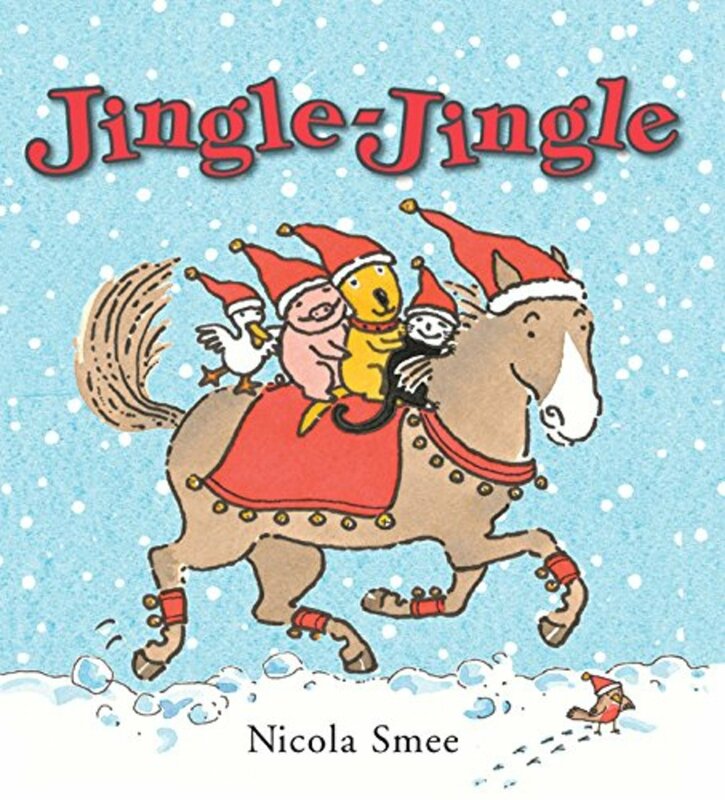 On the first page, we see a horse all decked out with a red saddlebag and collar, complete with jingle bells. He asks a cat, a dog, a pig, and a duck if they'd like to have a ride in the sleigh he pulls behind him. (All the animals are characters we first met in Smee's previous book Clip Clop.) The four of them pile into the sleigh, and the horse tells them "Hold on tight!" They proceed to trot along at a regular place. Here's where the words first say"Jingle-jingle!" and everyone with you can jingle along while you read the text. I usually say "jingle-jingle" several times (even though it's only said twice in the book) to give everyone a chance to shake their instruments. On the next page, the animals ask to go over the fields, and the horse once again reminds them to hold on tight. "Jingle-jingle, crunch-crunch." Again, I have my listeners jingle the bells and say “crunch-crunch” with me. On the next page, the horse, sleigh, and occupants are at the top of the hill, and of course, they want to slide down the hill. The horse agrees, but asks "Is there room for me? "I always ask, “What do you think? Is there room for the horse, too?" The illustration on the next page is priceless. The horse has indeed climbed aboard the sleigh, legs all akimbo while the other animals gather in front, leaning over the front in anticipation. This time, they are the ones to remind him to "hold on TIGHT!" Off they go, speeding down the hill. "Jingle-jingle, swoosh-swoosh," say the words. At this point, I had my audience jingle their bells, then swoosh them back and forth. The sleigh goes faster and faster, and so do all the people with jingle bells. But on the next page, the animals and the sleigh run into a complication: a snowman at the bottom of the hill. "Look out! Look out!" warns a rabbit. But it's too late. The sleigh runs into the snowman, and all the animals are tossed into the air with a big "Wheeeeeee!" At this point, I have everyone one moved their bells in an arc above their heads and say "Wheeeee!" along with me. Then the animals all land in the snow. "Jingle-plop! Jingle-plop! Jingle-plop-plop-plop!" I show everyone how to jingle their bells high then tap the floor with the bells on all the "plops." On the next page, the animals all raise up, little tufts of snow on their heads crying "Oh dearie me!" because the horse is still buried, only his ears and back showing. Not to worry though, on the next page he lifts up his head exclaiming "That was so COOL!" Then they all climb back into the sleigh and continue sliding, "Jingle-jingle, swoosh-swoosh! Wheeee!" As you can tell, this book offers a great way to play together to make the sounds, whether you use actual jingle bells or just say the words together. One thing I always point out is that the second two-page spread shows a sleigh with no top, pulled by one horse. It is truly, a "one-horse, open sleigh." And, of course, that gives you an opportunity to sing the song "Jingle Bells," or to put on the music and sing along with it. I like Raffi's version the best. All the more fun with jingle bells. The illustrations are just marvelous, nice and big, simple, yet conveying both motion and emotion expertly. One more thing I like about this book is that the font is so big and the language is so simple. It can be a great book for beginning readers, those children ages 4-7 who are just starting to read. It uses fairly simple, well-known words and repeats quite a bit. This could be a welcome book for an older sibling to read to little brothers and sisters, encouraging them to join along with the "jingle-jingle" part. The delight in Snowballs is in the illustrations. 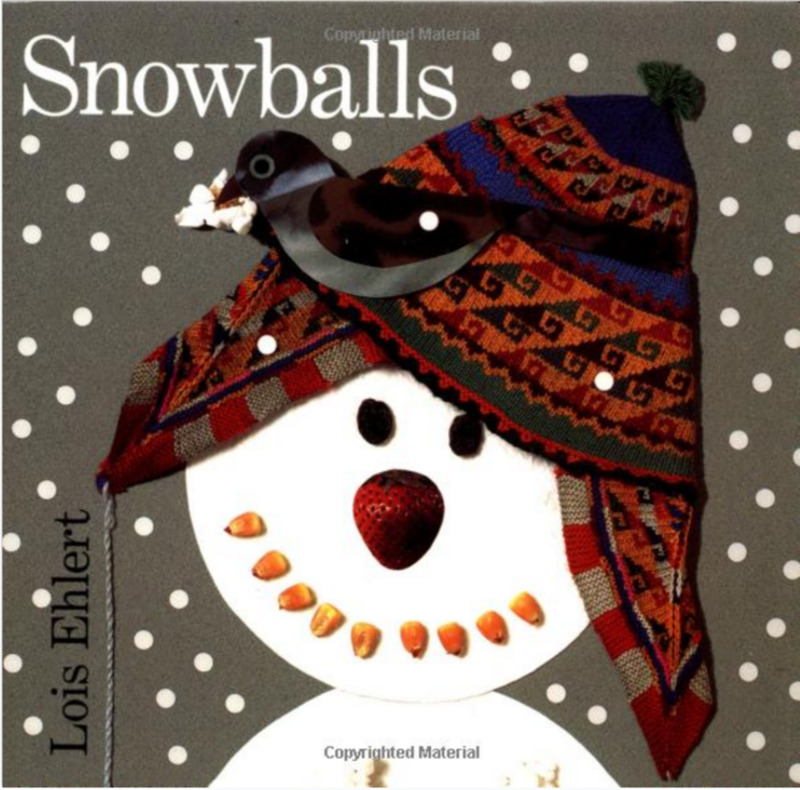 Ehlert is a master at collages, and in this book she takes the simple idea of a snowman and expands on it, creating a snow dad, a mom, a boy, a girl, a baby, and even a snowcat and dog. She has cut out white, textured paper for the head and body and used a variety of found objects to decorate each figure. Much of the fun of this book is to hold a child on your lap and look together to see the common objects. 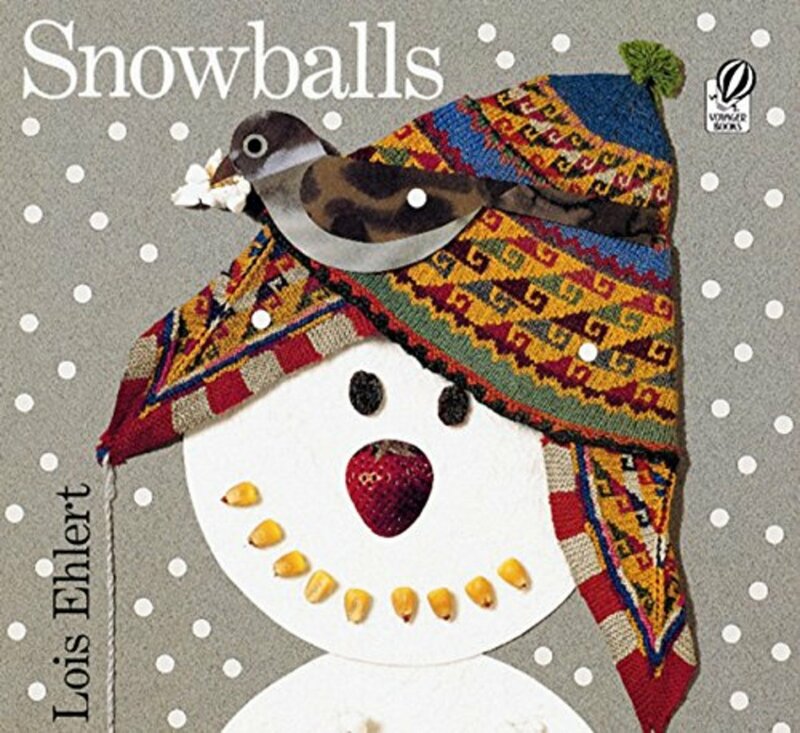 On the first page alone, you find a knitted hat, raisins for eyes, a strawberry for a nose, corn kernels for the mouth and popcorn to give the body some texture. Along the way, your little one can point out seashells, toy tires, pine cones, a small compass, and lots of other things. 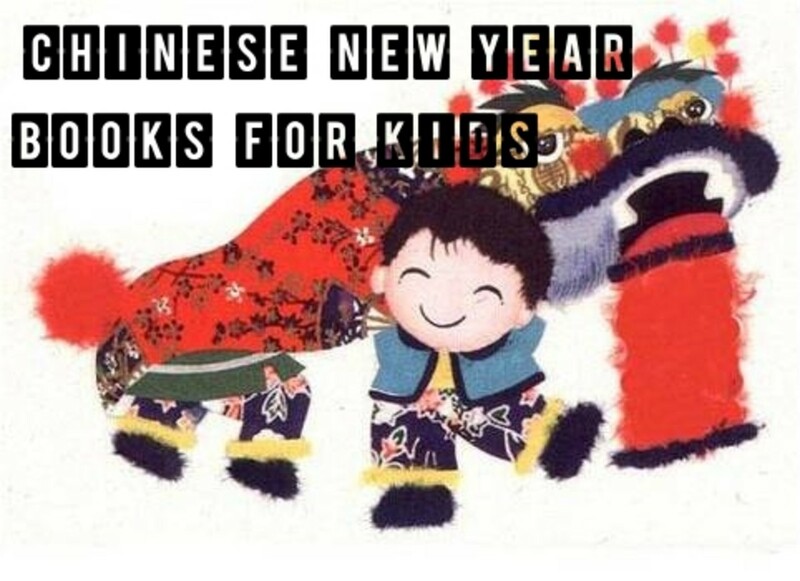 I especially like the cat which has red maple leaf ears and some long red and yellow fish for eyebrows. At the end of the book, Ehlert says "I guess you know what happened when the sun came out." Everything melts down, until she says "So long, snowball." Ehlert was one of the first to incorporate a little nonfiction into her books. At the end, she includes pictures of all the of the objects she used, labeled with the words--a great thing read through together with your kids to increase their vocabulary. On the next page, she shows a photo of a clothesline hung with brightly-colored knitted gloves. Each is labeled with its origin: Wisconsin, Korea, Italy, Afghanistan. On the next pages, she has several pictures of actual snowmen (which are always more irregular than those perfect circles we see in books). She also includes a few paragraphs explaining what makes it snow. And, last but not least, she has a recipe for popcorn balls together with a photo of one decorated like a face using raisin eyes and a pecan nose. Since the story includes melting, I always think of the song "Dance, Freeze, Melt," which is a fun song to act out. Just look on YouTube for "Dance, Freeze, Melt" by Mr. Eric and Mr. Michael. The librarians I work with have long been fans of Karma Wilson because her language is so much fun to read. 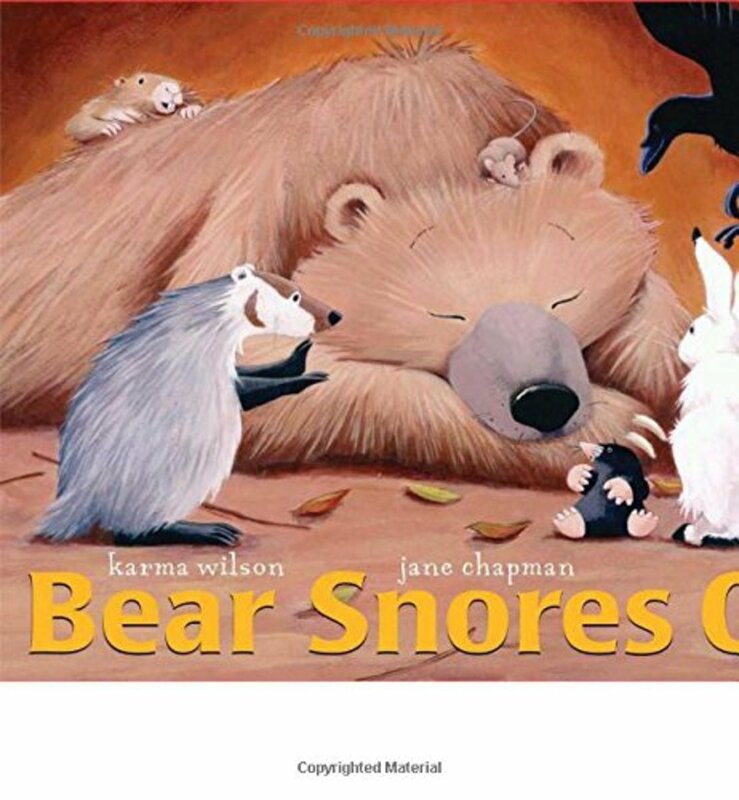 Bear Snores On is a fun, cumulative tale with wonderful illustrations by Jane Chapman. At the beginning of the book, we see a snowy cave with a figure of a bear snoozing away. Wilson is known for her rhyming, and she starts us out "In a cave in the woods, in his deep dark lair, through the long, cold winter sleeps a great brown bear." Right away she sets the tone and introduces a vocabulary word: lair. On the next page, we see him from the front, shifting in his sleep, but still "with his eyes shut tight." "The cold winds howl," Wilson tells us, "and the night sounds growl. But, the bear snores on." This is the time when you want to encourage your listeners to say, "But the bear snores on," with you because it's going to repeat several times during the story. On the next page, we see a little mouse creep in, looking small against the big den. I want to transcribe the three sentences on this page because it will give you a real sense of Wilson's use of language, "An itty-bitty mouse, pitter-pat, tip-toe, creep-crawls in the cave from the fluff-cold snow. Mouse squeaks, ‘Too damp, too dank, too dark.’ So he lights wee twigs with a small, hot spark." Isn't that brilliant? Try reading it out loud to yourself and listen to how the rhythm carries you along and feels like the motions of a little bitty mouse. Notice, again, that we have some words you may not use in everyday conversation: damp, dank, spark. It's important for children to come across these words in the books they read so that they can better understand what they are reading when they are older and the vocabulary gets more sophisticated. As the mouse is warming his little paws, a rabbit peeks in. The two of them popcorn and brew some tea, and of course...."the bear snores on." Then, along comes a badger and a gopher and a mole, along with a wren and a raven. Pretty soon all the animals are drinking tea, eating popcorn and dancing around the fire. And, in case you've forgotten him, the bear is still there. Wilson tells us, "In a cave in the woods, a slumbering bear sleeps through the party in his very own lair." But, just as the party is rocking, a small pepper fleck from the stew they are cooking makes its way to the bear's nose. On the next page, you and your listeners can do a big "Raaaaaa-choooooo!!!!" And of course then, "The bear WAKES UP!" He is looking none too happy, and all the animals are hiding our scurrying towards the mouth of the cave. But soon, they notice that the bear is blubbering because they've all been having fun while he hasn't had any. Mouse reassures him that they can make more popcorn and tea. Then the bear is happy eating and drinking until dawn, when he finds he can't sleep, but the other animals are exhausted and "his friends snore on." This book rises to keepsake status because of the absolutely charming illustrations and the vibrant language. A fun activity to do with this book would be to brew some tea and pop some popcorn, all the better if it's a snowy day as it is in the book. Another little activity is to cut a round hole in a sack to be the bear's "den." You can decorate the outside with drawings of trees and the forest. If you have some cotton balls, you can glue some "snow" to the entrance of the den. Then you can cut out some animal shapes (Google image search is a great resource for all kinds of pictures), or you can use some stuffed animals to go in the den. Sayre is quite the photographer as well as a wordsmith. I don't know of any other book which captures so well the sights and feel of winter as Best in Snow. 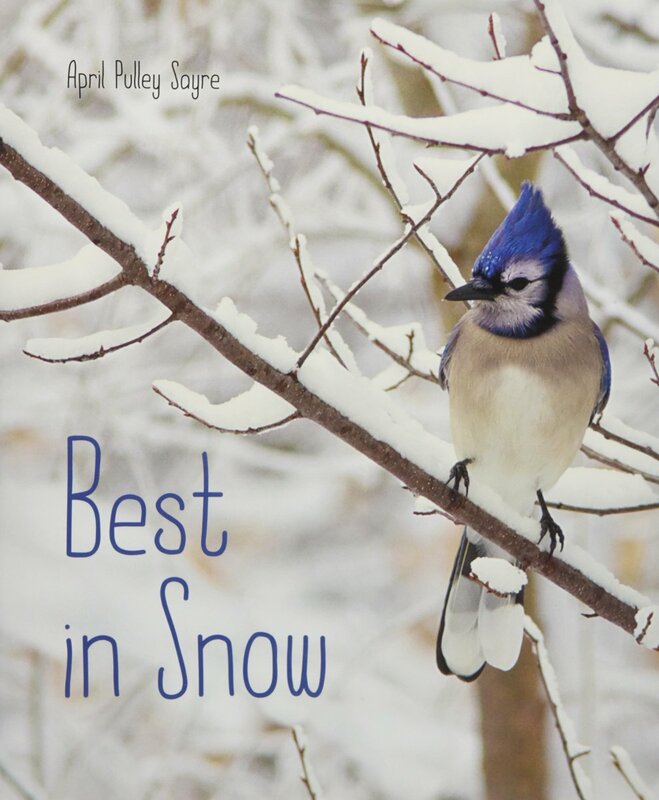 The front cover with the blue jay is absolutely gorgeous, and I've included a few pictures from the interior of the book below so you can really get a sense of the photographs, which show a snowy, winter world. Sayre starts simply, with a closeup photo of frost (on a window? a frozen pond?) with the words, "A freeze.'' Turn the page, and you see a photo of a puffy, hazy cloud against a gray sky. The text reads, "A breeze. A cloud." Turn the page, and we read "It snows." Here we see a group of red-winged blackbirds at a feeder, some of them in sharp relief and some of them in the blurry background, wings raised as they come in for a landing. 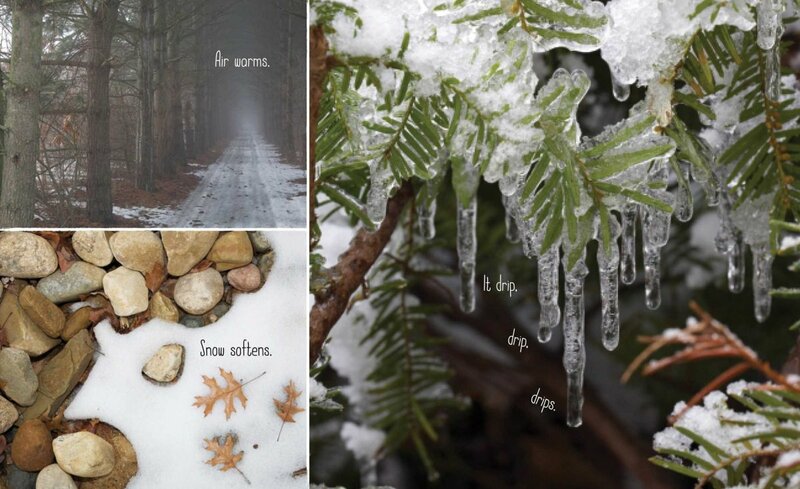 The snows and the leaves mix together on the facing page to form a backdrop for the text. Turn the page, and you read "Snowflakes land on a squirrel's nose." And there is the squirrel, close up and sharp, his fur dusted with snow as he stands up, apparently alert to something in his surroundings. 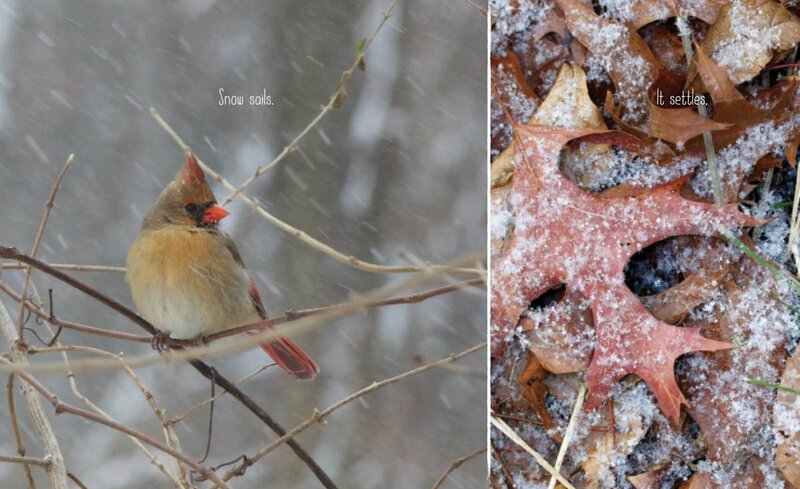 Keep turning pages, and you'll see nature portrayed with an artist's sensibility: the red of a female cardinal set against the red of fallen oak leaves (you can see that two-page spread below), a tangle of twigs each frosted with snow, a mallard duck shedding water droplets from the snow. Sayre's story continues by showing what happens when the snow stops and the sun shines down in a blue sky. Icicles form, then begin dripping. The ice becomes slushy, a deer peeks out, and then another cloud sweeps in, and we see the blue jay and the squirrel once again catching snowflakes on their fur and feathers. Children who live in snowy places will recognize the winter scenes but may learn more about the names of the animals and the processes of freezing and melting if you talk with them about the pictures. Sayre's text is so stripped down that it leaves lots of time for you your little ones to talk about what you see. The book continues the mini science lesson with a couple of pages in the back that explain how snowflakes form, what causes them to sparkle sometimes, why water crystals feather, etc. There is also a short list of suggested reading which includes poetry, biography, and some science. The best thing to do after this is to take a little walk with the children around the neighborhood. Give each child a disposable camera to take his or her own pictures. If there is snow, so much the better, but even if there is not, they can snap photos of some birds, some squirrels, some leaves, and whatever else is interesting. Later you could put the photos into a mini-scrapbook and talk about the different plants and animals you saw. 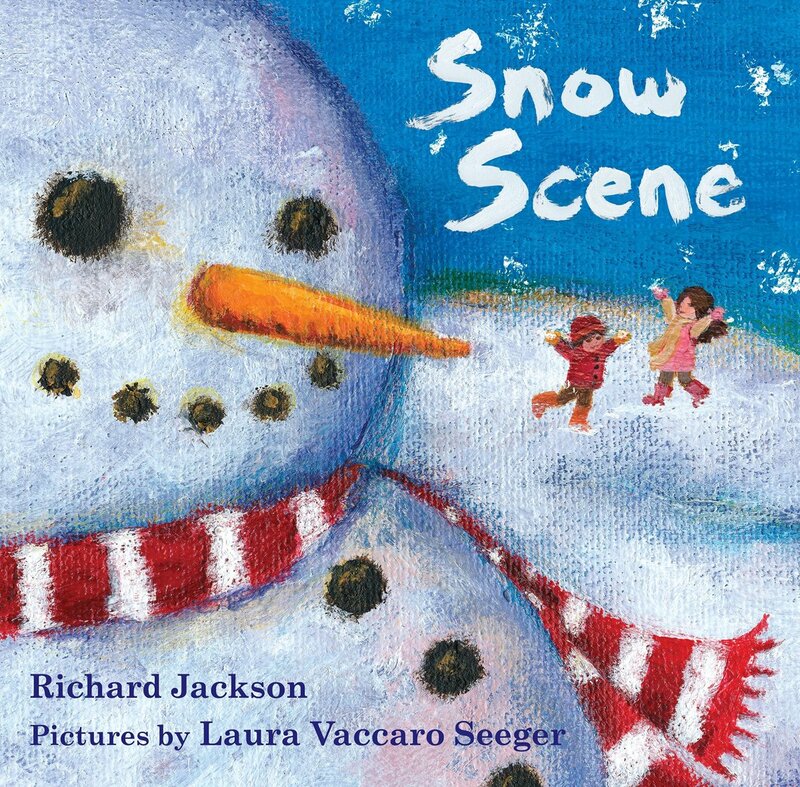 I love to read books like Snow Scene to children because they include a guessing game we can play together. I've always liked Laura Vaccaro Seeger's illustrations, and in this book, she provides visual clues on one page that let you guess what's coming on the next page. For instance, on the first page, we see some white columns with a few dark smudges. "What are these?" the text asks. When you've had your child make some guesses, you can turn the page to the answer: "Trees." I'm guessing they are aspen or birch trees because they have such light bark. On this two-page spread with the trees, we see another clue, a dark shadow on the right-hand side of the page. Does it look a little like a bird wing or a tail? Turn the page, and you find crows. Keep playing the games and you'll see a tree with "an icy bough" a boy in a red hat and jacket (and red ears from the cold), frosty hair, a snowman, and other winter scenes. But then, the weather grows warmer, and we see "hints of green," brown earth, and finally, April rain. In May, we are treated to a scene of daisies and bumblebees. Turn the page, and we see bunnies and trees with pink blossoms. (And, a child reading a book under a tree. Yay for literacy!) Next, we see a girl, a dog, and a squirrel all running across the green and flowered hillsides until they see a mountain in the distance. The peak is high and snowcapped. The text says “And will you look at that? Winter’s hat!” It’s a reminder that winter is still with us in some ways, even in the summertime. Seeger’s artwork captures the seasons with textures and thick layers of paint. It’s a book to keep for the artwork as well as the story. 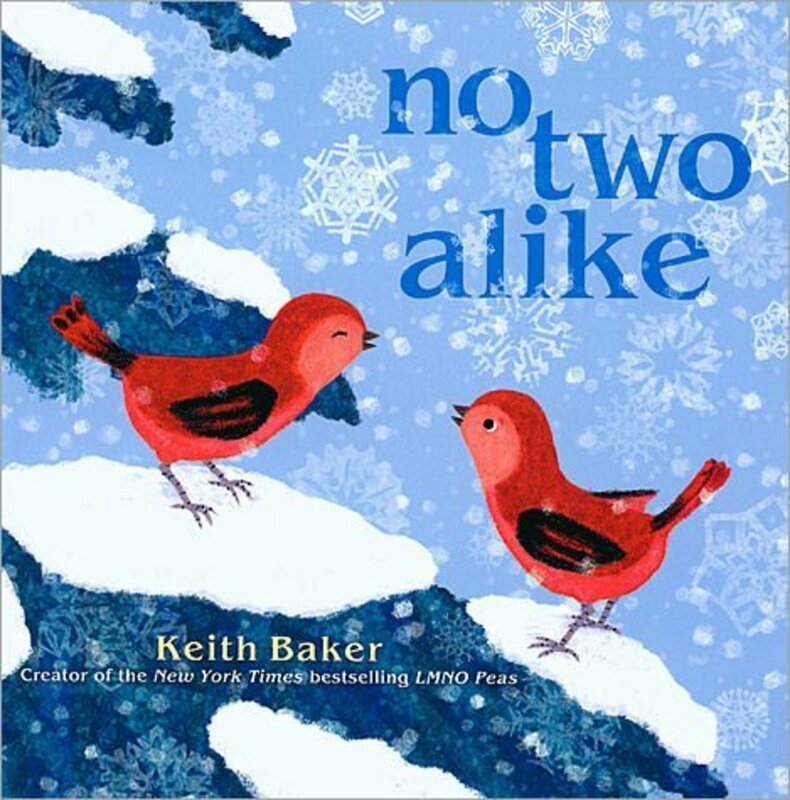 The cover of No Two Alike, with its snowflakes and cheery red birds catches my eye every time. I even like the end papers, a collection of stamped snowflake shapes on a background of light blue. Turn to the first double-page spread, and we see the two birds soaring joyfully through the snow from their little green birdhouse. The illustration are simple, but evocative. We can see that a light dusting of snow has already settled on the trees and the roof of the birdhouse. The text begins, "No two snowflakes are alike," and then we turn the page. The birds are doing loop-de-loops, and the text says "almost, almost"; turn the page again, "but not quite." Now the birds are on a branch, one of them reaching out its wings to catch a snowflake. We can see some of the snowflake shapes clearly, and it's true: they are almost alike, but not quite the same. This is a good time to stop and really look at the illustrations with your child. Talk about what you see in the picture: How many points do the snowflakes have? How are they alike? How are they different? What are the birds doing? What kinds of trees do you see? Why are some green and some brown? Talking about the pictures is especially helpful on the second, third (or 99th!) reading. 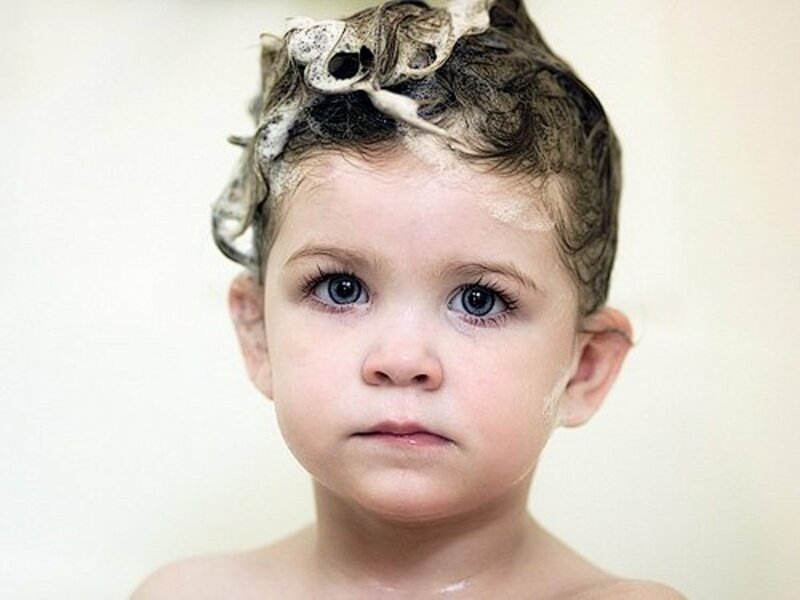 The child already knows "what happens" and can stop to observe and carry on a conversation about the book. We may think that children get lots of opportunities to converse, but studies show that some children mainly live their days responding to directions. "Get your coat on. Let's go. Don't pick that up. Drink your juice." 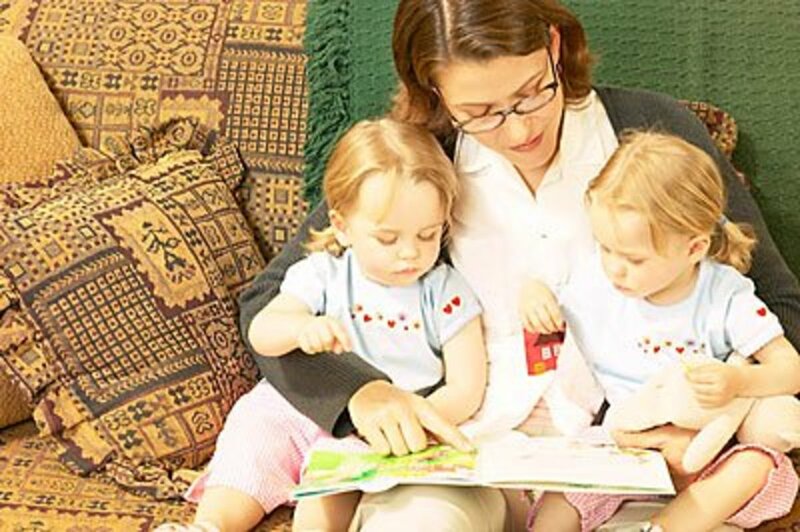 One of the reasons that education professionals stress reading so much is that the stories and pictures give children a chance to offer opinions, ask questions, answer questions, and carry on the conversations that we will expect of them later in life. All right, back to the book. When we turn the page, we are still on the theme of "no two alike" in nature. No two nests, no two tracks in the snow, no two branches, or leaves, and so on, as the little birds charmingly explore their surroundings. Near the end, they look at each other and ask "Are we the same—just alike?” You and your child can look closely and compare. You'll find at least one difference, which is confirmed at the end of the book as two different feathers fall to the ground. I can think of several activities you can do with the kids after reading this book. 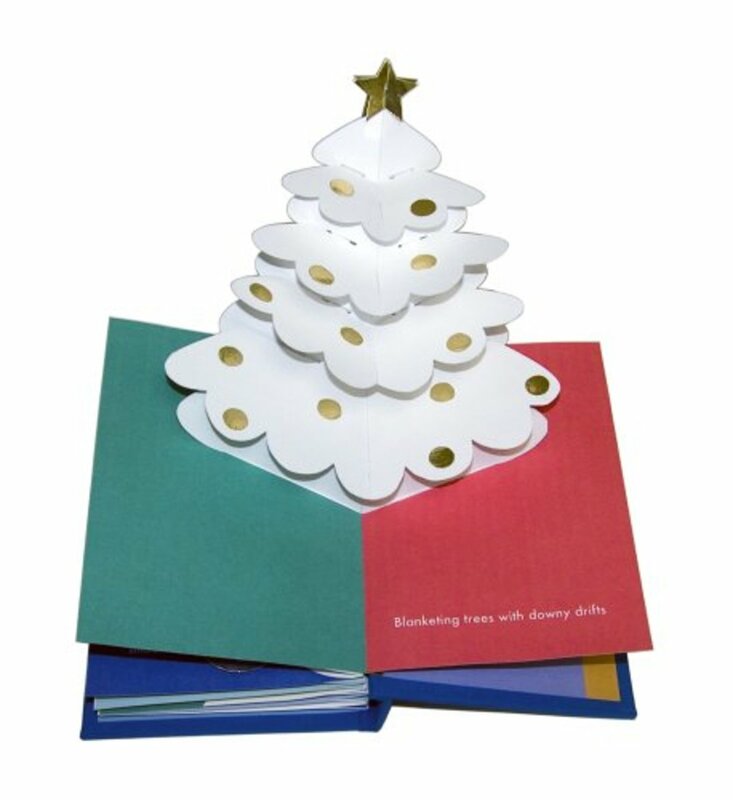 One would be to make paper snowflakes. If you search the internet for "simple snowflake patterns," you'll find a wealth of things to print and cut. You can also search for simple origami birds to make from colored paper. Another thing to do would be to hang up a bird feeder. Or, if you already have one, take the children out to fill the feeder and watch to see which birds will come. Jan Brett is known for her exquisitely detailed drawings which convey a type of old-world charm. In The Mitten, she retells a Ukrainian folktale about a boy who convinces his grandmother to knit him a pair of new white mittens. At first, she is reluctant, telling him that if he drops one, he'd never be able to find it because it would blend in with the snow. But, since her grandson really wants white ones, she relents and makes them for him. Before he goes out, she warns him that she will look to see if he still has them when he comes home from his wandering. It doesn't take long before the boy drops one in the snow and doesn't notice it, leaving it behind. A mole discovers the mitten and burrows inside. Then, along comes a rabbit, a hedgehog, an owl, a badger, a fox, a bear, and a mouse, all of whom want inside. During this time, the mitten stretches and stretches and stretches. Finally, the mouse's whiskers tickle the bear's nose, and he gives a great big sneeze, ejecting all the animals and sending the mitten into the air. At this point, the boy is coming by and sees his mitten floating down from the sky. He grabs it, and when he goes to his grandmother, she first checks to see "if he was safe and sound" and then she checks to see if he still has his new mittens. Turn the page, and we see grandmother looking at the two mittens, her face a little perplexed. One is normal sized and one is about five times as big. Brett wisely doesn't add any text to this last page, which gives you an opportunity to talk with the children about what happened and why the mitten is so big. They can also tell you what they think will happen next. These skills of summarizing, hypothesizing, and predicting are the basis of the critical thinking they'll need in school. Another thing Brett is known for are the borders to the pictures in her books. In this book, we see a hint as to which the next animal will be before we turn the page. We also see the boy searching for his mitten on each one. Once you've read the book through once, it's fun to go back and talk about the "story within the story" with the children. Even though Brett is mainly known as an artist, she uses good, descriptive language as well, the kind that can help with building vocabulary. On just one page, I come across the words commotion, swooped, grumbled, and glinty talons. No wonder her books have become classics. Here is another great thing about Jan Brett: her website is chock full of pictures you can print out from her books. 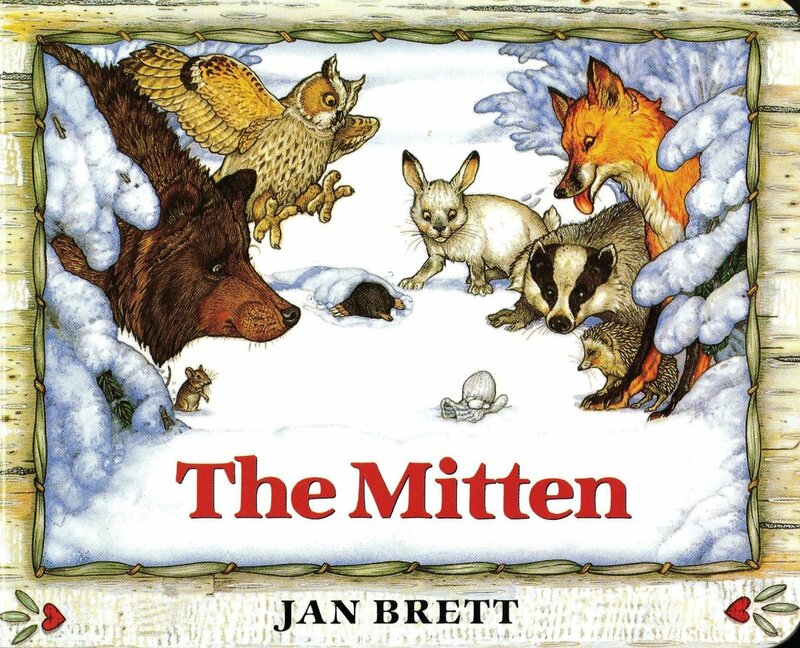 Here is a link to "Tell Your Own Mitten Story" which includes printables of the mitten and the different animals. 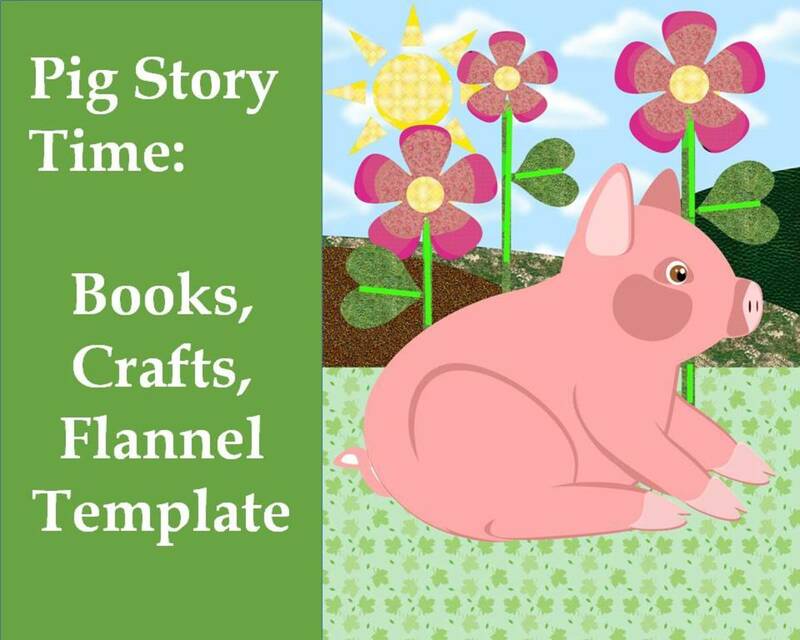 The children can color them and then re-tell the story, change the ending, or tell their own story using the animals. If you have kids that like to do crafts, she has a wealth of things on her site that you can print and do on a rainy or snowy afternoon. Bunny Slopes is a clever little take on the term used for the gentle hills beginning skiers use for practice. 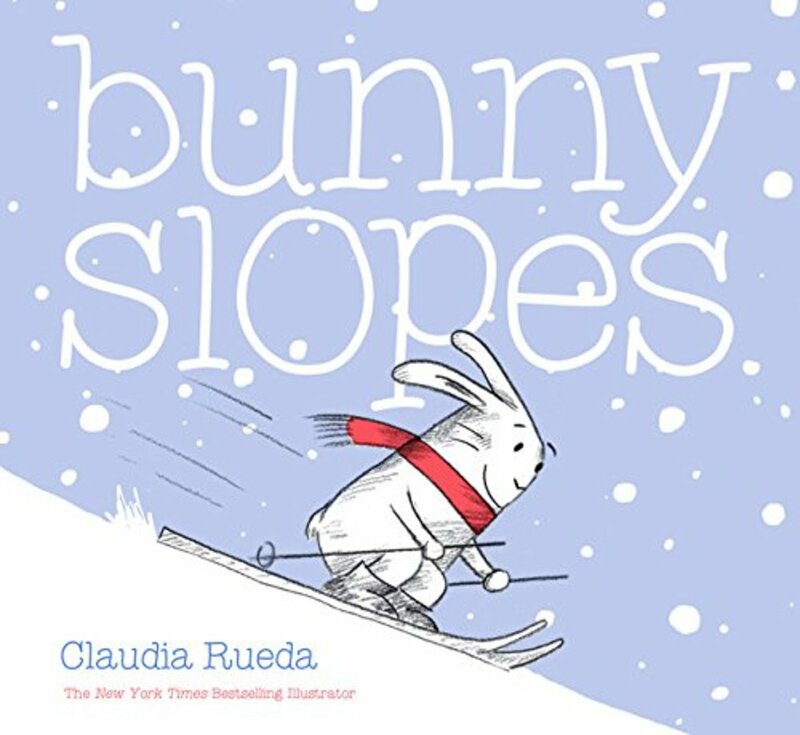 Many children start out their skiing careers on the "bunny slopes," but in this case, Rueda has drawn an actual bunny going down a hill. The drawings are cute and charming, but the actual reason I chose this book is that it's part of a trend of interactive books that address the reader and ask them to do certain motions. The thing that delights the children is that when they do what the book says, they can turn the page and see what has happened as a result of their actions. This is your cue to hand the book to the child and let him or her shake it until they think it's good enough. Then, it's time to turn the page. You'll see a light drifting of snow, but the bunny will ask if you can shake the book much harder. Of course, your child will be happy to do a harder shake. Turn to the next page, and you'll see just the bunny's ears under a pile of snow, which should elicit at least a giggle. 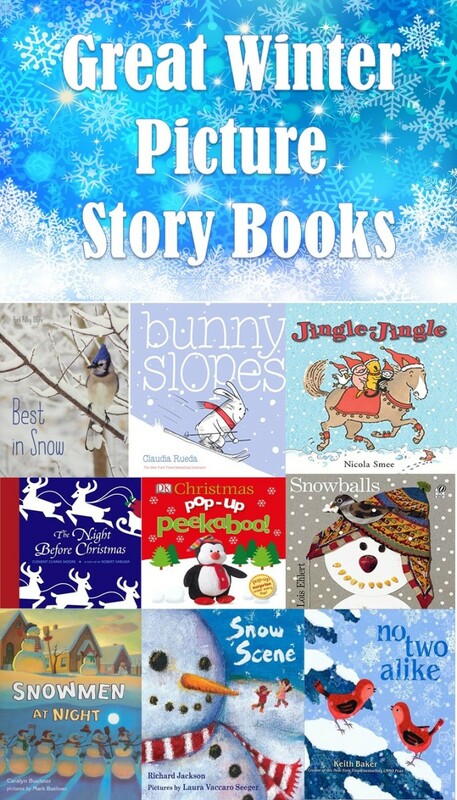 The bunny will tell you that maybe that was a little too much shaking and ask you to "tap tap tap" the top of the book to pack down the snow. The story continues in like fashion, and you and the child you're sharing the book with can tilt to make a hill, turn the book when the bunny goes off a cliff, and watch as the bunny falls in a hole (an actual circle is cut into the book.) I won't give away the ending. Suffice it to say that falling into a hole can sometimes be a good thing. Another thing I like about this book--outside of its entertainment value--is that it teaches a child to follow directions. It also teaches some vocabulary, like the word "tilt" and also some concepts, like faster and slower and left and right. It's a great little book that guides you in ways to interact and play with your child by reading it. There are pop-up books, and then there are Robert Sabuda's pop-up books. He's taken on the title of "paper engineer," and when you open one of his books, you'll know why. His figures are so complex and ingenious, you wonder how he can possibly make them. Winter in White is a keepsake around our house. It's a tiny little thing and one of his more simple, elegant books, using stiff white paper with just an accent or two to bring his figures to life. You'll see a snowman rise up, a sledding child, a reindeer with a small gold bauble on his antlers. The one I like best is the skater who spins as you open the book. I don't know how he did it, but it's a charming effect. The fact that she is spinning on a shiny silver sheet just completes the scene. Sabuda's books are delicate, so it's probably best to share them with children ages 3 and up who can keep from grabbing the little figures and damaging them. After you've read the book, you can actually make your own pop-up card, engineered by the author himself. He has a nice little website which shows you how to make all kinds of pop-ups, including a reindeer, an angel, a menorah, a Christmas tree, a poinsettia, Santa, a snowflake, and a Christmas tree. Each one has a pattern you can print onto card stock. They look daunting at first, but he really does have very good step-by-step instructions with pictures showing you how to assemble them. If you're working with elementary-aged kids, it's a good exercise in taking your time and reading instructions carefully, a skill that will help them through all their lives. And when you are finished, you'll have a charming little pop-up to give away or display at your house. 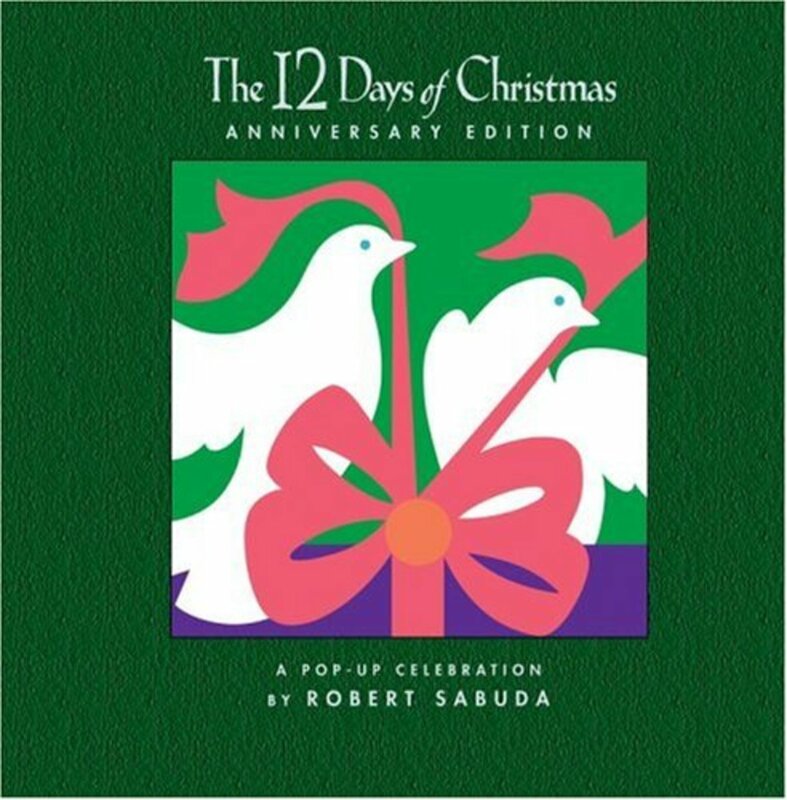 I took The 12 Days of Christmas down from my shelf recently and marveled once again at the creativity and engineering of this book. It’s bigger and more complex than his Winter in White book, and I’d save it as a keepsake gift for a child who’s at least 6 years old. Open the book, and of course, a partridge pops up, its wings stretched in flight. The green and yellow pears add a dash of color to the scene. For the second day, you lift a flap on the side and see the two turtle doves together in an antique birdcage. Most of the figures are done in white paper, which accents the shapes and the engineering, more than if everything were full color. We continue on through each day in a similar manner. 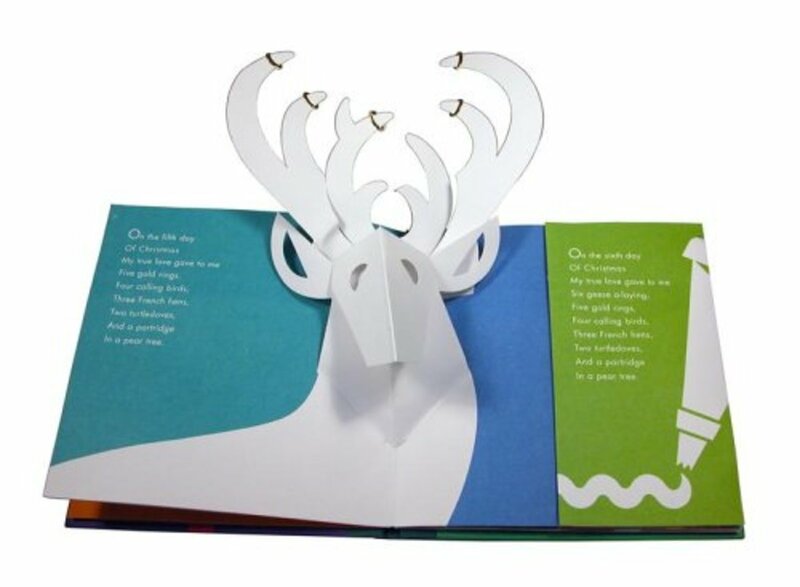 Some highlights are the “Five Golden Rings” page, which has a beautiful foldout stag, the rings adorning his antlers, and the “Seven Swans a- Swimming” page, which uses a clever ring of plastic that rotates to make the snow fall. I made it super easy, with just one puppet, and a lot of interaction with the audience. You wouldn’t even need a puppet. You could play the main character and have the children hand you the cards with the different figures. I include printables, too, so that everything you need for the show is right there. It would be a fun thing to do with the family for Christmas Eve, or in the afternoon on Christmas Day when the children are looking for something new. 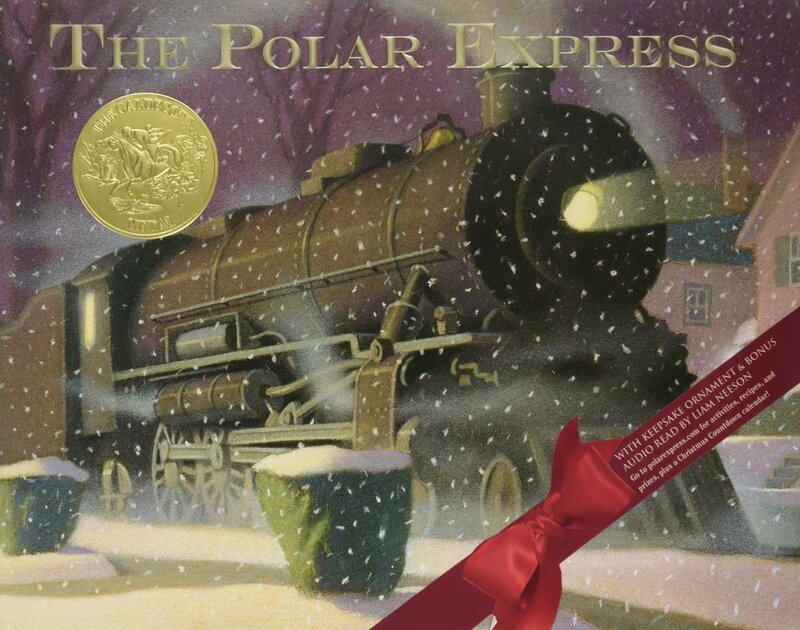 The Polar Express is the granddaddy of all Christmas gift books, and if your kids or grandkids don't have a copy, you'll want to get one for each family. The main feature of the book is the mood portrayed by author and illustrator Chris Van Allsburg. His oil pastel illustrations capture a cold, yet cozy, winter night. His use of light and shadow conveys an aura of mystery and of magic. And somehow, as you take in the scenes, you're always aware that there is something more behind the picture. Things are a little out of focus, sometimes short of detail in a way that lets you fill in with your imagination. The story is about the innocence of childhood at Christmastime. A boy's friend tells him won't be able to hear Santa's sleigh bells because there is no Santa. But, on Christmas Eve, the boy does hear a noise--though it's not the sound of bells, but rather the hiss of a steam train. He boards when the conductor tells him it's the Polar Express, heading for the North Pole. He finds it occupied with children in their pajamas being served hot chocolate and eating candy. Finally, they reach the North Pole and the boy sees all the elves, the reindeer, and Santa himself. There the boy makes his wish and receives a Christmas bell from Santa, the first gift of Christmas. It turns out that only children can hear the bell, not grownups. The exception is the boy himself, who says "Though I've grown old, the bell still rings for me, as it does for all who truly believe." I've talked so much about the illustrations, but I fell I need to give Van Allsburg's writing its due. It's evocative, with sentences like "It was wrapped in an apron of steam." "We drank hot cocoa as thick and rich as melted chocolate bars," and "We climbed mountains so high it seemed as if we would scrape the moon." The 30th-anniversary edition comes with a downloadable audio track narrated by Liam Neeson (though you can easily call it up on YouTube) and a special ornament. If you are so inclined, you can also find a version narrated by William Hurt on YouTube. While you're reading this book, it makes sense to make some hot cocoa, (there's a "North Pole Cozy Cocoa" recipe on the Amazon page for this book) and maybe sing Christmas carols, like the children on the train do. You can also buy a large jingle bell to give to the kids along with the book. 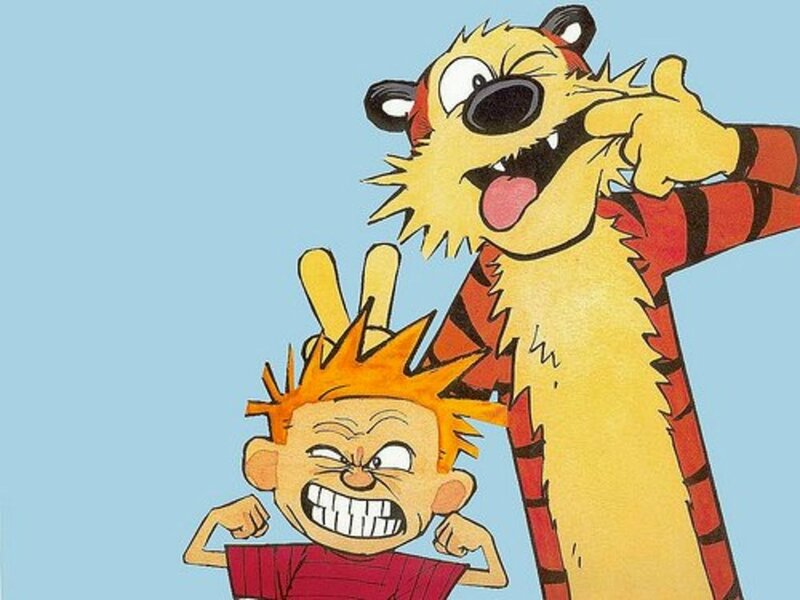 Imaginary Friends - What's Normal and What Isn't?